MENLO PARK, Calif. (CNNMoney.com) -- Remember the stereotype of the lone inventor, toiling away in the solitude of a garage? Now picture that garage on steroids: a 15,000-square-foot playground for nearly 700 tinkerers, with folks busily crafting all manner of prototypes, from faux leather iPad cases to server cooling systems. That's TechShop. Opened in 2006 in Menlo Park, Calif., it's a D.I.Y. geek's paradise, a wonderland of lathes, drill presses, welders, sandblasters, industrial sewing machines, table saws, grinders and everything else you've ever dreamed of stuffing into your own garage. Members pay $125 per month (or $1,200 a year) for access to the shop's machine; day passes go for $25. Training in skills like soldering, sandblasting and chocolate molding are open to anyone for a per-course fee. Some members use the tools to fix up their kids' tricycles, build custom furniture or print logos on T-shirts. But more than half of them are chasing projects that, with luck, will go beyond the personal realm. They're the entrepreneurs. Take Patrick Buckley, founder and CEO of San Francisco-based DODOcase. The company sells iPad cases that resemble Moleskine notebooks with fake leather covers for $60 a pop. To create his prototype, Buckley needed access to a $25,000 machine called a ShopBot, a robotic tool that can carve images in wood, foam and other materials. "TechShop was a perfect place to prototype," says Buckley, a former research scientist. "I was able to use hundreds of thousands of dollars' worth of equipment that I could have never afforded to buy myself." Getting a company like DODOcase up and running used to require a lot more time and startup capital. But with cheap access to expensive machines, Buckley was able to create a DODOcase prototype for under $500. The 29-year-old entrepreneur says his company is about to hit $1 million in sales -- just five months after its launch. That's exactly the kind of inexpensive innovation that Jim Newton, 47, the founder and managing director of TechShop, had in mind when he opened for business four years ago. A former robotics teacher and engineer, Newton started TechShop because he had more than 200 ideas for inventions -- from a smart sprinkler system for irregularly shaped lawns to a portable device that warns pilots of nearby aircraft -- but lacked the equipment to build them. "I tried to think of a way to model the business so I could play with the machines and pay for them with a revenue source," Newton says. "One of the methods that occurred to me was the fitness club model." TechShop CEO Mark Hatch says the company's Menlo Park location will bring in $1 million this year, up 50% from last year. The model is one Hatch would like to replicate. A planned partnership for an Oregon offshoot fizzled, but a North Carolina TechShop is thriving in Raleigh, and new branches are slated to open later this year in San Francisco, San Jose and Detroit (where Ford Motor Company is a collaborator). Hatch would like to launch 100 more TechShops in the next five years: "It is realistic, but aggressive." Silicon Valley may be the epicenter of entrepreneurial geekdom, but Hatch believes TechShop will draw customers in all parts of the country. That's good news for would-be inventors who live outside of Silicon Valley. But getting a startup off the ground takes more than the right tools, cautions Trevor Blackwell, a partner at Y Combinator, a Mountain View, Calif., venture fund that invests in early-stage startups. "Running a company means raising money, finding customers, hiring a team, and 100 other things you don't learn in college," Blackwell says. 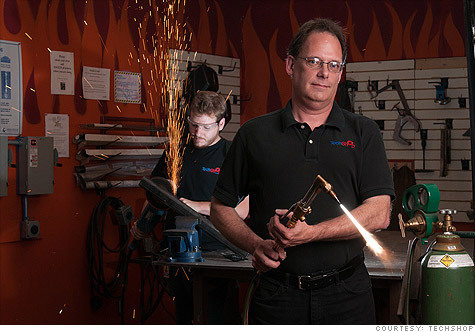 Still he views TechShop as an "incredible resource," and has seen several prototypes made there lead to full-fledged companies. "One of the good things about working at TechShop is that there are always people around you to ask when you're stuck," he says. That sense of community is evident at TechShop's Menlo Park space, where inventors work side-by-side on board games, clothing designs and lunar landers. "I think everyone has ideas for crazy inventions or little things that they would love to have to improve their own lives or the lives of others," says TechShop founder Newton. "The problem is that too many of us give up."